Amnesty International UK expressed its immense disappointment today at the Financial Times’ decision to pull a new hard-hitting advertisement at the last possible moment. The ad was due to appear today as Shell held its London AGM. 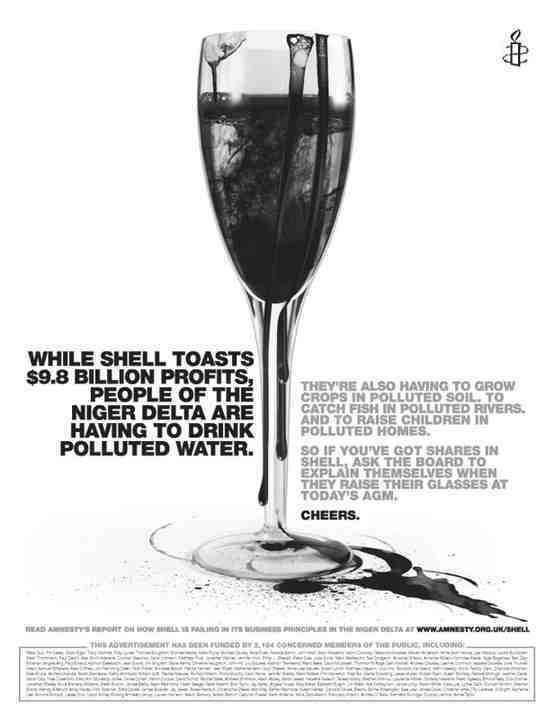 The advertisement focused on the appalling human rights record of Shell in Nigeria. It compared the company’s $9.8bn profits with the consequences of pollution caused by the oil giant for the people of the Niger Delta. Numerous oil spills, which have not been adequately cleaned up, have left local communities with little option but to drink polluted water, eat contaminated fish, farm on spoiled land, and breathe in air that stinks of oil and gas. “The decision by the Financial Times is extremely disappointing. We gave them written reassurances that we would take full responsibility for the comments and opinions stated in the advertisement.